Citroen will unveil a massive, nine-seat MPV called the SpaceTourer at the Geneva Motor Show, due on sale mid-2016. It may look like a van, but in fact the SpaceTourer is a dedicated MPV designed on the C4 Picasso platform, meaning it promises far greater refinement than the average commercial-vehicle-turned-people-carrier. Three versions are available, named XS, M and XL, with the biggest being 5.3-metres long and the ‘compact’ version 4.6 metres. Five seats are standard, though across two trim levels buyers can specify seven, eight or nine seats. Boot capacity is 1978 litres in the XS with five seats equipped, or 2932 litres in the XL version. The middle version is 4.95 metres long and with a boot 2381 litres big, though as any middle sibling will testify, this is likely to be the version everybody ignores. 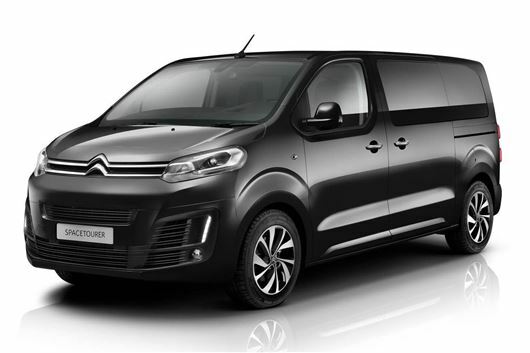 Use of the C4 Picasso platform extends to the running gear, so the SpaceTourer gets engines and gearboxes from the comparatively miniscule-looking MPV, while Citroen claims exceptional agility thanks to an especially tight turning circle. Basically, this is the least van-like van-like MPV there ever was. Citroen has, unusually, separated the two trim levels into one for family buyers and one for business users. The former, called SpaceTourer Feel comes in all three lengths and with five, seven or eight seats. In this version the middle row of seats slides fore and aft, while the seat backs can all fold flat for additional loading space. The second version, called SpaceTourer Business, comes with up to nine seats and has a greater range of customisation in order to appeal to taxi firms and the like. All versions get options including hands-free opening for the motorised sliding doors (operated by waving a leg under the side skirts), and a rear window that opens fully, to avoid having to open the huge, heavy tailgate unnecessarily. There are two glove boxes, the upper of which is cooled, while rear passengers get sun blinds and power sockets. In addition, the SpaceTourer debuts a new seven-inch touchscreen display that will make its way into other Citroens in due course, including Apple CarPlay functionality. A head-up display is available too, as well as myriad safety features including road sign recognition, lane departure warning, active cruise control and driver attention alerts. It has already been crash tested by Euro NCAP to five-star standard. Engines are all BlueHDI diesel units, with 95, 115, 150 and 180PS outputs, with average economy ranging from 48.7mpg in the most powerful to 54.3 in the 95PS version equipped with start/stop. Five- or six-speed manual gearboxes are standard, with an automatic option available too.